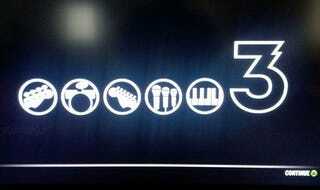 There's a demo for Rock Band: Green Day currently up on Xbox Live. Of actual interest is this image greeting users when they quit the demo, teasing Rock Band 3 with a little ebony and ivory. Take a look up there at all those little icons. We've got bass, drums, guitar, vocals - the three mics suggesting the harmonies from Beatles: Rock Band are carrying over - and finally, on the right, a keyboard. Sure, not every song has one. Not every band has a pianist or keyboardist, either. But some do, and it looks like we'll now be able to rock out to those songs as nature intended. Below, a little something to get you in the mood.